This year's gingerbread for the coffee table - kids won't let me go a year without one :-). Thought this would be an easy project I could whip out in a couple of evenings. What a dope. There is always a design flaw I don't know about until under construction. My first rockers were too narrow the first go around and broke so I beefed them up and everything is good. This is AWESOME!!! Good job!!! It's 18 inches high and the rockers are approx 20" front to back. 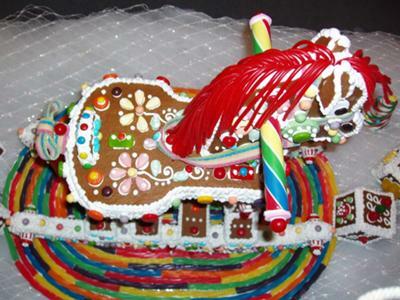 Absolutely stunning gingerbread rocking horse! 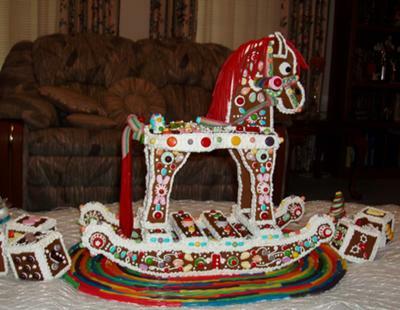 It brings back memories of my best friend's house growing up and their Swedish rocking horses! How tall is this? 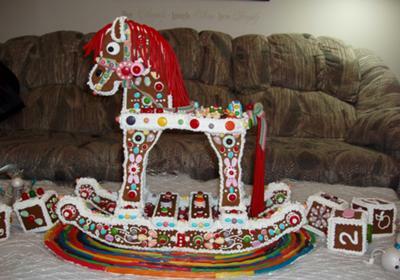 Judging from the sofa in the background, it looks like your gingerbread horse is HUGE! Love all the colorful candy.